Personalization for retail customers has advanced well beyond segmentation to include real one-to-one connections made in real-time. Not only are consumers expecting hyper-personalized experiences across all touches, but companies who are able to implement them are seeing unprecedented growth and a new level of customer loyalty. This essential guide walks you through personalization from the nuts and bolts of what it can do, through 5 levels of implementation that businesses can use to benchmark their path to increased revenue. • The latest advancements in personalization technology and what companies can expect to gain with implementation. 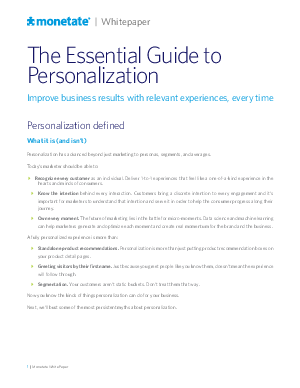 • Four myths about personalization that may be holding your company back. • Tips for getting started and 5 benchmarking levels to help you create a personalization roadmap for your company. • Eight questions to ask when shopping for a personalization partner that will help you ensure you are getting the right tools and expertise to create a successful program.